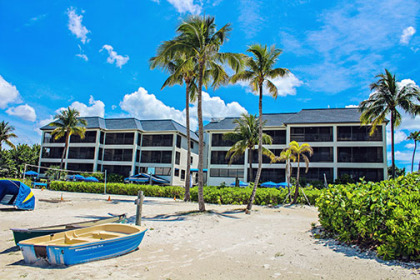 Buy a timeshare at Bluegreen Mariner’s Boathouse & Beach Resort in Fort Myers. For a popular vacation destination for couples, families and a group of friends, there is literally something for everyone. Vacationers are able to experience the stunning beaches and beautiful wildlife in their natural habitats. Fort Myers offers many attractions for families to enjoy during their stay in the area. Visitors are able to experience dolphin sightings along the Gulf of Mexico or alligators in the Everglades. To enjoy the area in comfort, vacationers are able to buy a Bluegreen Timeshare. 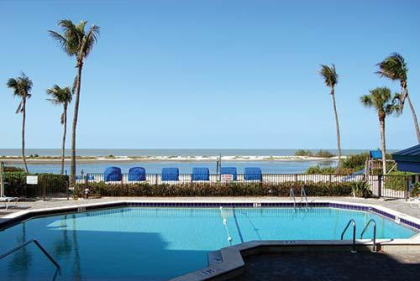 With the opportunity to buy Bluegreen Mariner's Boathouse & Beach Resort timeshare, resort guest have access to a beautiful ocean themed resort located on the beachfront. The resort consists of two dozen villas with 1 to 2 bedroom units. Each villa is specifically designed to resemble a comfortable yacht. The units have private balconies or porches with wonderful views of the beach and sparkling water. Included in each unit are the comforts of home with a galley kitchen, TV and VCR as well as a coffee maker and blender. The rooms are a welcoming place to rest after a day of exploring the attractions of Fort Myers. During the evenings, there is an onsite gas grill to take advantage of for a home cooked meal. Bluegreen timeshare deals offer an excellent opportunity for a fun vacation. As a Bluegreen Corporation vacation resort, guests have many occasions to enjoy onsite activities. During hot summer days a pool is an inviting way to cool down from the heat. Children have multiple opportunities for fun with the playground, activity program and game room. In addition, volleyball and shuffleboard are available to play on the beach. The Bluegreen timeshare resales provide a chance for families to have the benefits of living in a hotel, but with additional comforts. The resort allows timeshare owners to explore a popular destination with the benefit of saving money. A family is able to have access to this property when a current timeshare owner wishes to sell Bluegreen timeshares. In addition, with Bluegreen timeshare deals, buyers will have significant savings by purchasing a timeshare resale directly from the timeshare owner. The resort is also an optimal location for those who love water activities and a beach setting. With the option to buy Bluegreen Mariner's Boathouse & Beach Resort timeshare, buyers will also have the chance to explore the natural sights of Fort Myers. A few activities include, exploring the beautiful waters on sailboats, horseback riding along the beach and nature trails. The area has several advantages for educational opportunities as well as fun. A few of the popular attractions include Adventures in Paradise Inc., Everglades Day Safari and Edison & Ford Winter Estates. Visitors that love boat tours will enjoy Adventures in Paradise and the many sea creatures that are available to view along the tour. During the tour, visitors are able to view dolphins, sea otters and seahorses throughout the waters of Sanibel & Captiva Islands. With the outer island cruises, there will be views of untouched beach for miles and of dolphins as they play in the ocean. For those who would like to immerse themselves in the Everglades, a day trip to the Everglades Day Safari will be a treat. The tour takes place on 780,000 acres of National Preserve of the Everglades called the Big Cyprus. Each tour consists of airboat rides, boat cruises, wildlife drives and nature walks. During the tour, guests are able to view a variety of animals such as bears, sliders and alligators. This tour is a great educational opportunity for families to explore the historic homes of Edison and Ford. A visit to the homes of these well-known historical figures is a portal into the eighteen the century. Visitors are able to enjoy the beauty of the estates as well as the views of the Caloosahatchie River. The estates are located on 20 acres that consist of historic buildings, gardens, Edison Botanical research lab, and Edison Ford Museum. There are various opportunities available to experience the wonderful area of Fort Myers Beach Florida. With Buyatimeshare.com buyers are able to buy a Bluegreen Timeshare at a significantly lower price than purchasing directly from a timeshare resort. There are also opportunities for current Bluegreen timeshare owners to post their properties on the website. Sellers who would like to sell Bluegreen timeshares use Buyatimeshare.com to get their property seen online worldwide. For those interested in the Bluegreen timeshare resales there are multiple timeshare resale properties available. Contact Bluegreen Resort's Mariner's Boathouse & Beach Resort Specialist Today!